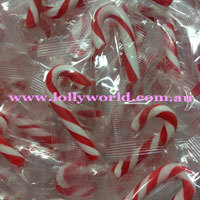 Candy Canes Christmas Mini are individually bagged mint flavoured mini canes with a red and white stripe. Perfect for table decorations, a Christmas Day treat or stocking filler. They weigh 4g each and measure 5cm. These candy canes do not have a loop for tree hanging.